This huge number of people is dependent on contact lenses or glasses in order to improve their visual acuity. But how do you find out whether you need such visual aid? How do you measure your eyesight? In order to measure your eyes, you can make use of an eye test. The first inventor of the decimal eye test was Ferdinand Monoyer. The French ophthalmologist created his famous Monoyer Eye Chart in 1872 and provided a unit of measurement for the optical power of a lens, called a dioptre. Each row of letters in different sizes represents a different dioptre – the unit that is still in use today. A dioptre is a unit of measurement of the optical power of a lens or curved mirror, which is equal to the reciprocal of the focal length measured in metres (that is, 1/metres). It is thus a unit of reciprocal length. For example, a 3-dioptre lens brings parallel rays of light to focus at 1⁄3 metre. Optical power of the human eye is 58 D.
What about the Snellen Eye Chart? 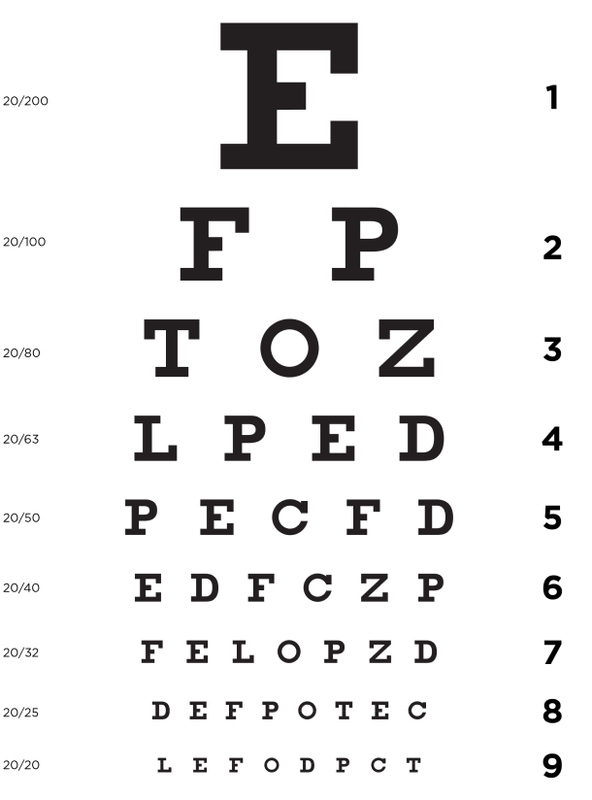 The Snellen Chart is still used today to measure people’s eyes. During an eye exam the eye doctor will ask you to find the smallest line of text letters that you can make out, and ask you to read it. If you can read the bottom row of letters, your visual acuity is very good. If you want to find out whether your eyes need a visual aid, you should see your eye doctor and ask to determine the clarity of your distance vision. If you want to find out at home how good your vision is, however, you can easily do the Snellen Eye Test before you visit your ophthalmologist. The test we're providing here can be useful to test nearsightedness, which causes blurry distance vision. That is particularly helpful to screen children for nearsightedness. 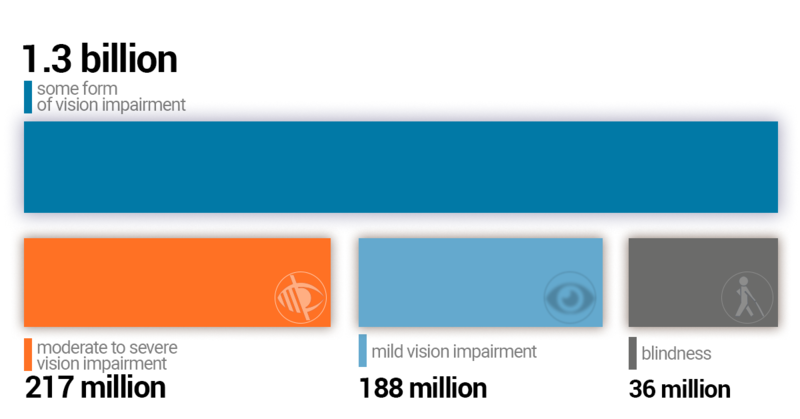 Farsightedness, astigmatism, or other eye problems can't be measured with our chart. Only a comprehensive eye examination by a licensed eye specialist or ophthalmologist can determine whether your eyes are healthy and you can see as clearly and comfortably as possible. 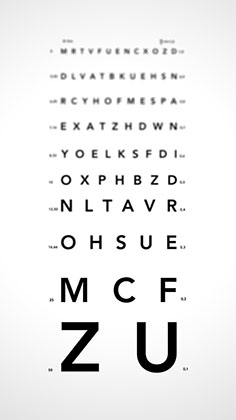 For the best accuracy, have someone assist you when testing your vision with the Snellen Eye Chart. 1) Place the chart on a wall about three metres away. 2) Cover one eye and read aloud the letters on the chart. 3) Begin at the top and move toward the bottom. 4) Repeat with the other eye, and then with both eyes together. 5) The smallest row of letters that you read accurately determines visual acuity in the uncovered eye. The results of your chart reading will determine the quality of your eyesight. Your vision results will be expressed as a fraction. Fractions are shown to the left of each row and identify how well you can see. If you could read clearly to the fifth line, for example, your vision will be expressed as a 20/40 vision. If you could read clearly to the seventh line, your vision will be expressed as 20/25. The numbers are given in feet, an American unit of measurement. One foot is about 30 cm . 20/20: A 20/20 vision means that you see the same line of letters at 20 feet / 6.09 metres that people with normal vision see at 20 feet / 6.09 metres— this means your vision is perfect. 20/40: A 20/40 vision means that you see the same line of letters at 20 feet / 6.09 metres that people with normal vision sees at 40 feet / 12.2 metres.